Trash collection remains every Wednesday and Saturday. On each regularly scheduled collection day, Best Trash will collect residential refuse located at the curbside in the provided roll-out carts. Please place the carts as close to the street as practicable facing forward. Residents are restricted to one Best Trash cart for refuse and are encouraged to confine refuse to the cart, however additional refuse may be placed in containers (between 30- 50 gallons) , boxes or bags (not weighing over 40 pounds) and placed next to the Best Trash provided trash cart. Items excluded from normal collection are dirt, rocks, bricks, tile, concrete, tires, batteries, motor oil, cooking oil, waste generated by a private contractor or any materials or items deemed hazardous materials. Please do not dispose of gasoline, motor oil, paints, cooking oil, or any other liquid items in a container that are not visible to Best Trash personnel. If such items results in spillage that causes a stain, Best Trash is not responsible for the cleanup. Best Trash will leave a tag explaining the reason for any non-collected item(s). Trees, shrubs, brush trimmings and fencing must be no larger than 4 inches in diameter, no more than 4 feet long, tied in bundles not exceeding 40 pounds. The tied bundles is required to allow quick pickup and size limitations are required to avoid damaging the equipment in the compacting process. Items such as appliances, furniture, mattresses, carpet (up to 1 room of carpet, cut less than 4 feet wide, tied in bundles not exceeding 40 pounds), will be picked up on both garbage collection days. By Federal Law, refrigerators, freezers, and any other items containing Freon must be drained of Freon and have an accompanying bill to validate such service was performed. 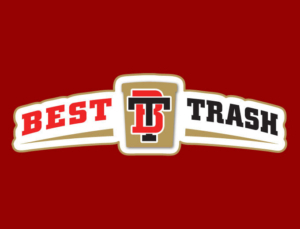 Best Trash takes great pride in our recycle program. Ensuring the best recycle program for our customers takes time and effort on both sides. Please remove caps, liquids and food products from inside the containers. Please only use the provided recycle cart for recyclable materials. The green recycle cart is NOT an extra trash container and will NOT be emptied as such. If items exceed container capacity, please place them adjacent to the cart well marked as recyclable materials. Cardboard is recyclable, please break down all boxes flat, and place them next to the recycle cart for collection. Best Trash will provide each current residence with one recycling cart and one trash cart. Best Trash will replace any carts that are defective or otherwise become unusable due to normal wear and tear. Lost or stolen carts can be replaced for $65.00 each by calling Best Trash. If your regular trash or recycling collection day falls on a holiday (New Year’s Day, Memorial Day, July 4th, Labor Day, Thanksgiving Day and Christmas Day) the collection will be made on the next regularly scheduled collection day.